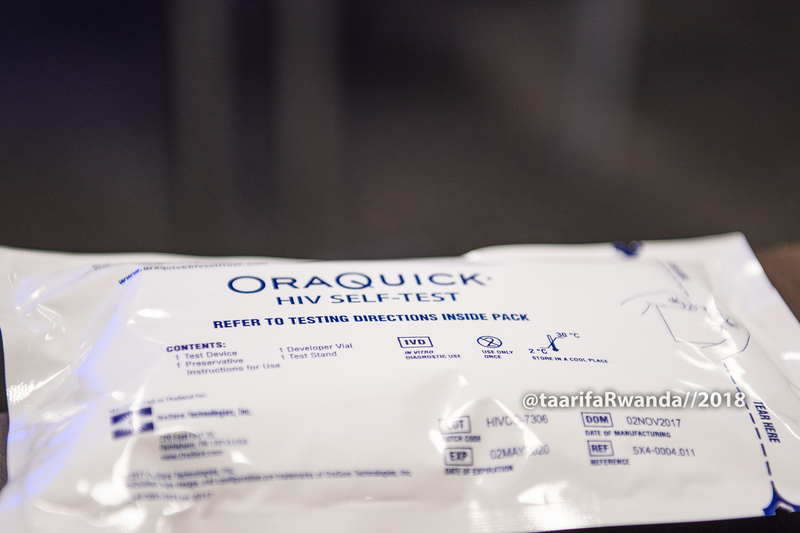 The OraQuick HIV Self-Test, a device used to self-test HIV in the comfort of your own home, is now could be available to Rwandans soon. Oraquick, manufactured by an American firm from Bethlehem, Pennsylvania, is the same device used by public health professionals globally. The OraQuick HIV Self-Test offers patients 12 years and older painless HIV testing without the need for blood or needles. The device uses oral fluid to detect HIV-1 and HIV-2 antibodies and is 99% accurate, according to the details in the manual. The device was unveiled at the Transform Africa Summit during the Imbuto Foundation Youth forum themed “The New Lens: Know. Treat. Suppress”, on Tuesday evening. As disruptive technologies continue to emerge in Rwanda and the African market, young innovators are being challenged to create digital innovations that can tackle regional health epidemics such as HIV/AIDS. While addressing the forum, Sandrine Umutoni, Director General of Imbuto Foundation, said that health advocates need to inspire the youth, nurture their ingenuity and capacity to design new solutions that will respond to, among other things, health issues in line with the world’s digital age. “As we engage in [this] a conversation, our hope is that the young minds gathered here are able to help bring forward ideas, that will strengthen our efforts in our journey towards eradicating HIV and AIDS by 2030,” Umutoni said. UNICEF figures in 2016, indicate that 73% of new HIV infections among adolescents occurred among African youth. The number of new infections is particularly daunting, considering the expected number of young people in Africa will rise to 750 million by 2060. Dr. Sabin Nsanzimana, a Medical Doctor specialized in HIV global management, said that despite HIV prevalence rate in Rwanda being at 3% for about a decade now, it is evident that there high infection rate among youth and women as compared to other age groups. Dr. Nsanzimana digital solutions which can bring sexual reproductive health in the hands of the youth—enabling access to information and services—will go a long way in bringing HIV to end. In 2016, Imbuto Foundation and partners such as UKAID and NFPA begun iAccelerator; a programme which encourages young people to think critically and creatively about issues related to sexual and reproductive health and seeks to generate innovative, youth-led solutions to these issues. The top four innovative solutions, which brings access to quality sexual and reproductive information and services for young people received a grant of US$10,000, and selected innovators were coached, mentored and trained under the programme. “Through initiatives such as iAccelerator we are reminded that once involved given the right platforms, the youth will contribute solutions that further engage, educate, empower our communities to thrive and live the dignified lives we are all entitled to,” Umutoni said.